Well, he huffed, and he puffed and as threatened he blew the house down !! 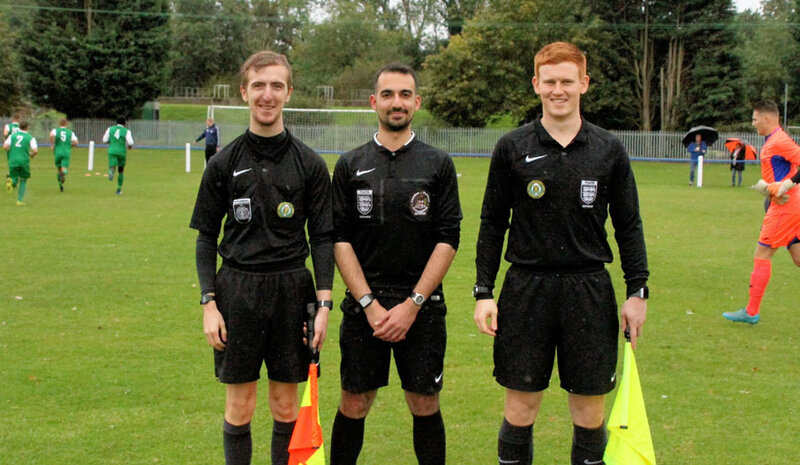 Tim O’Sullivan blew last week in the defeat at Harefield in the FA Vase, he said not acceptable, I won’t put up with this, and his threats became a reality as he made five changes, included one new signing debut for a 17-year-old and a bench debut too for a young player from our excellent reserve side. Very good debut from young Ollie Lawford. 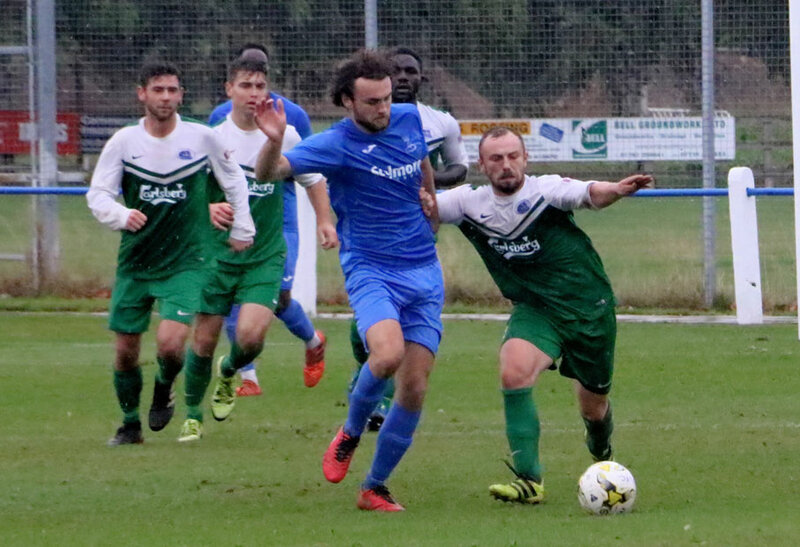 Jets on the back of five straight defeats ( two in cup comps) had to make changes, and the players had to respond, and what a big ask at Potton United, fresh from the UCL League and one of the preseason fancied teams, also Jets longest away trip so not a day most were looking forward to. Strong leadership from skipper Tom Gibson today. Heavy A1 traffic and red lights jammed near the ground made the long trip even longer and ruined the staff’s pre-match plans, and a quick prep was put into place, but there was time for the old sourpuss to growl his requirements for the day. Combative Andy Brennan made such a difference for Jets. Formation and shirt occupiers meant that he had an excellent midfield choice lining up together of Stevens, Brennan and Jones, one that injuries and holidays have stopped from being possible. Up top, Kerley and an excellent debut start for Ollie Lawford, just 17, who has joined us from youth football at Chesham. Jets back line also changed with both Jamie Speer and Harry Beaumont recalled to the side. Jamie Speer came back into the team. 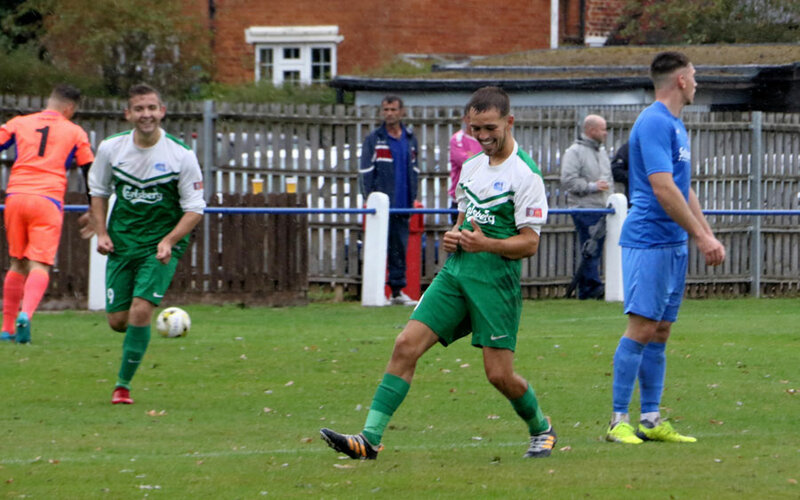 Harry Beaumont also came back in as the team looked to turn around their recent poor form. The heavy rain only brightened briefly by the nice pass over by the Lancaster bomber, made the excellent pitch slippery. It was hard and wet, so this was going to favour the ballplayers, and both sides had them. Potton’s rapid wingers were a right handful, and Speer and Beaumont had excellent matches holding these lads at bay. Jets and Potton were end to end, and it was a right old ding dong, but with this surface and the unpredictable officials, anything could happen. 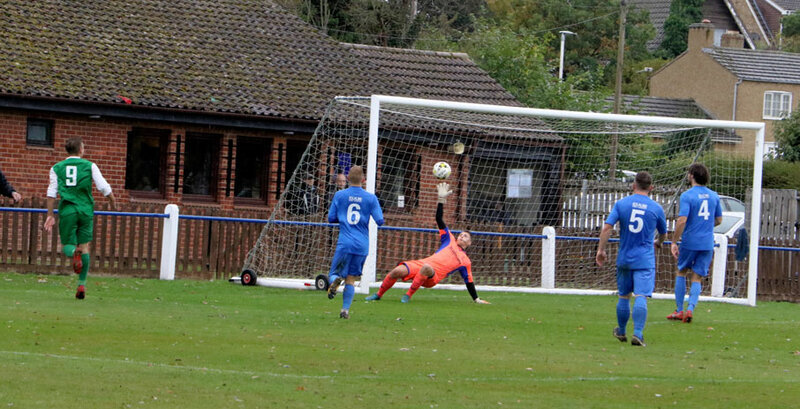 The keeper denies but the rebound falls to Nick Kerley. Kerley taps home to put Jets into the lead. Jets got the early break, and it was puppy love as young teenage sprat Ollie Lawford who got his first assist. With a frame built for either speed or the Mr Muscle advert auditions, the nippy kid beat his man and laid the perfect ball to Nick Kerley to at first be denied by the keeper but instantly pounce on the loose ball to tap the rebound into the empty net 0-1. Jets kept pushing, and there were near misses both ends then the most bizarre of decisions by the match officials was to bring the game level. Potton pumped a high ball into the box, and a massive penalty appeal went up as Deji, foot very high, cleared but also caught the tall striker on the head. The striker went down and stayed down with Nooo from the referee. 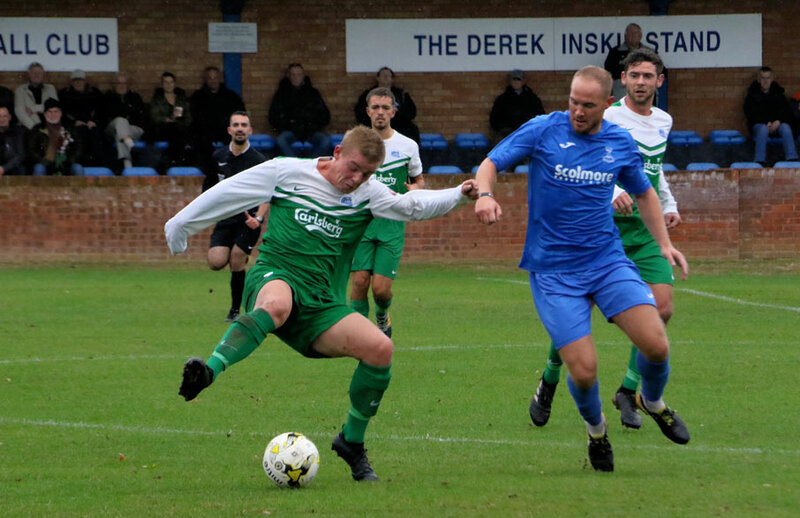 Brennan cleared, but the ball came straight back and seeing the ball coming towards him the downed striker had enough recovery to lift his legs in scissor format to allow the ball through across goal and into the net. To everyone’s amazement, it was given, then not given then after a long, long discussion by the ref and assistant given amongst scenes of disbelief. It was so wrong. A penalty perhaps in the first place, but once it became play on and the player reacted to the low cross, he became active and had to be offside. 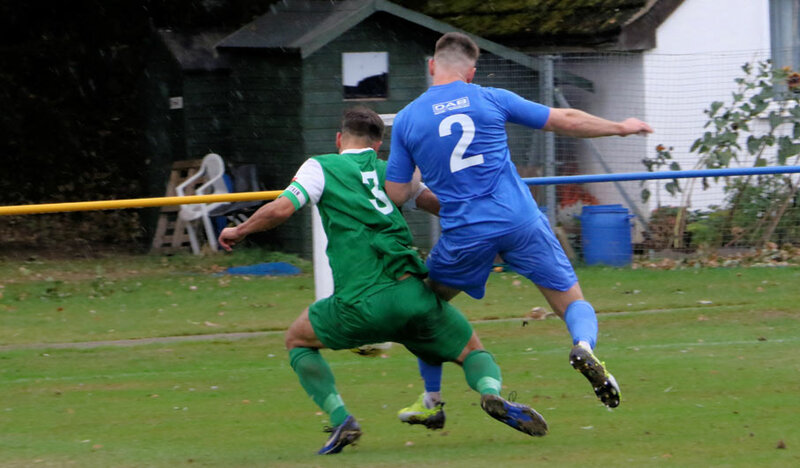 The decision threw Jets as they do lose their heads at times and the hosts took the upper hand and increased their tally 2-1 with a calm slot on a total clear break. Scare for Jets – down 2-1 at the break. Tim offers Leigh his old boots! The talk was firm, positive then reduced entirely to tears of laughter as Tim’s moment of generosity met with disbelief to the horror of the boss. Worrying about Leigh Stevens footwear choice he offered him as the same size his sideline Adidas World Cup 66 type “cos they are studs”. Leigh politely refused the offer saying “I don’t feel they will help me improve much, to be honest”. Silence before the whole changing room cracked up as once the first person broke, everyone did! They will now go to the Natural History Museum. 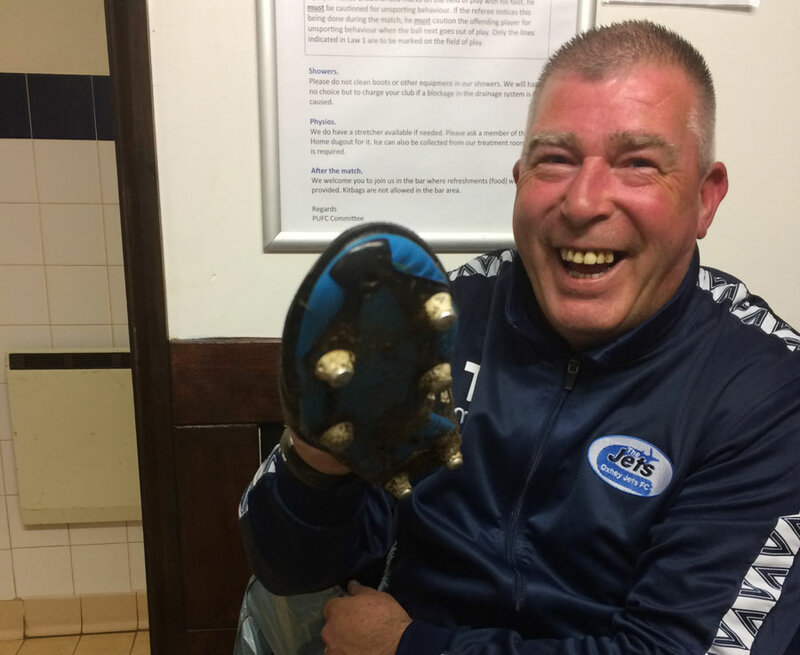 Leigh Stevens politely declined Tim’s boots. Luke Jones sparked up in the second half. So, atmosphere lifted, Jets came out and from the off went for the equaliser. 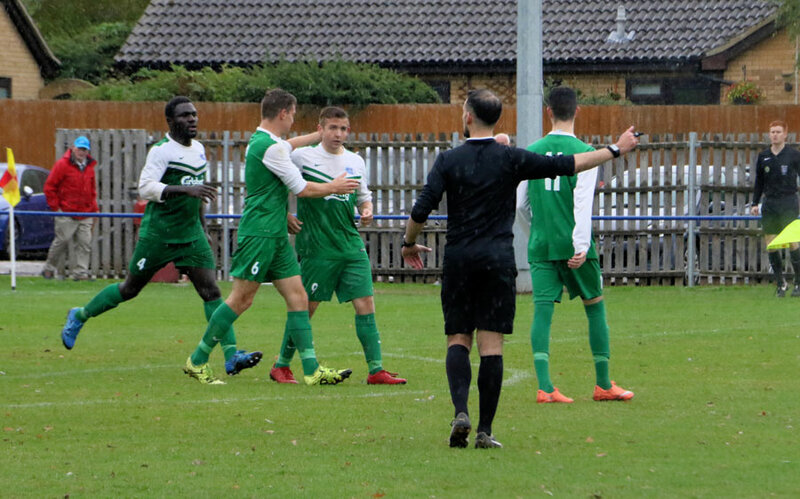 It wasn’t a long wait when following a hotly disputed free-kick for a foul on skipper Gibson ( camera proved the officials right on this one). 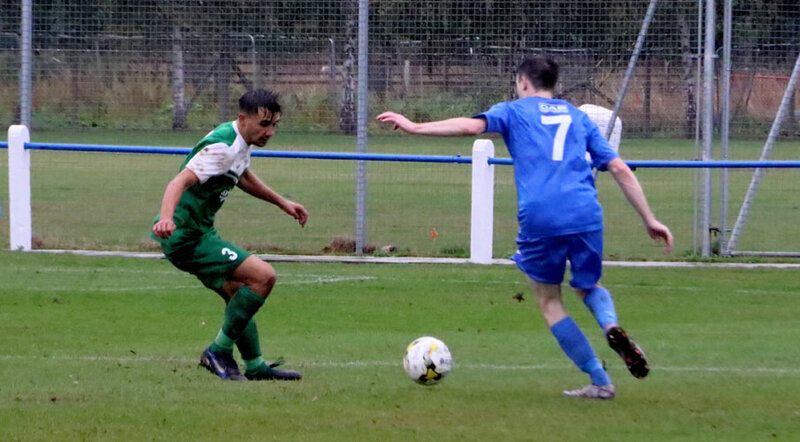 A twice scrambled clear attack was then hit by Nick Kerley from outside the box, and it beat the keeper coming up off the surface and into the net 2-2. 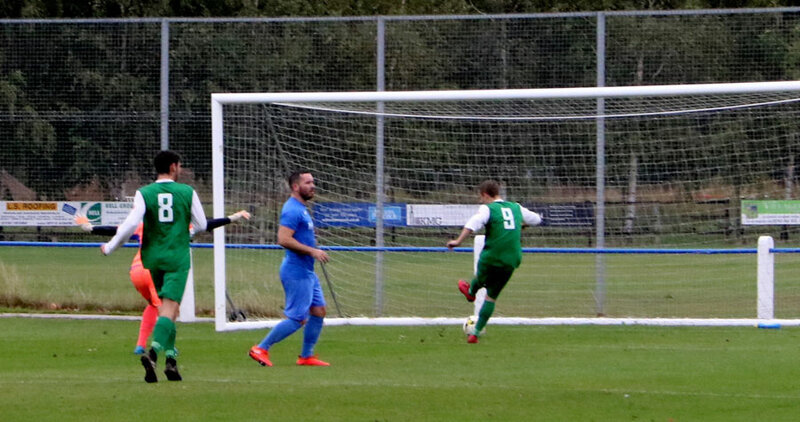 Potton disputed this free-kick versus Tom Gibson that led to Jets equaliser. 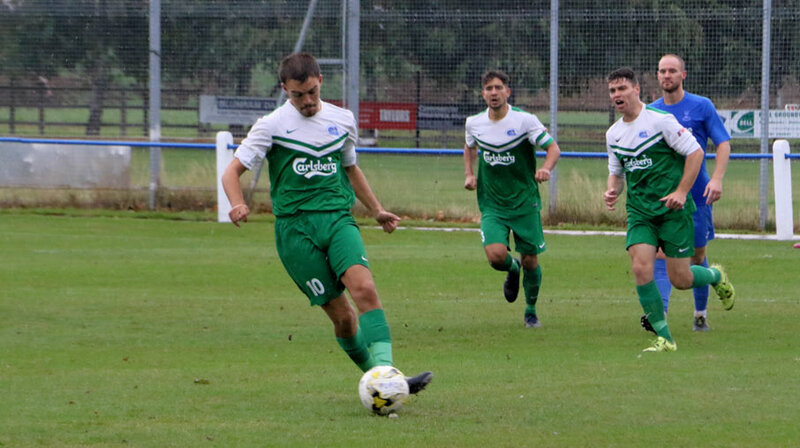 Nick Kerley’s long range shot heads for the goal. 2-2. Celebrations as Jets draw level. 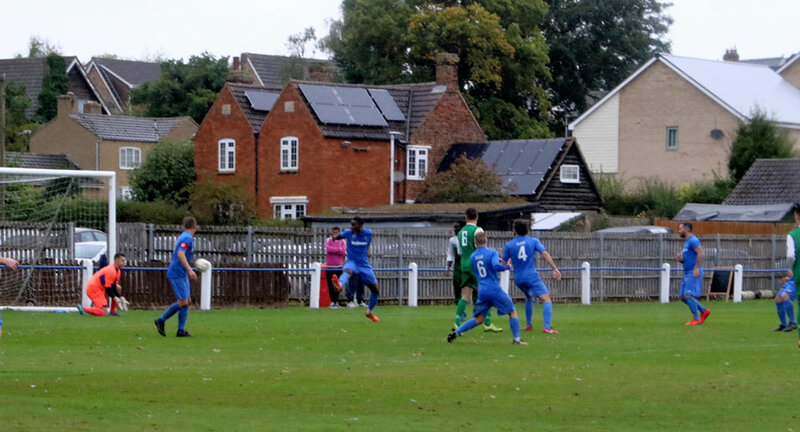 Jets stayed in the ascendancy as the hosts appeared to tire and another long-range effort by Luke Jones, who had lifted his match so much in the second period it was like a substitution that fired jets on all cylinders, flew past the Potton keeper. 2-3 Jets. Luke Jones (far left) strike a long drive for Jets winner. Luke Jones joy at what proved to be the winner. Nick Kerley then went through 1:1 and should have tied the game up but missed out and gradually Jets fell back as the jitters of hold what you’ve got took over. 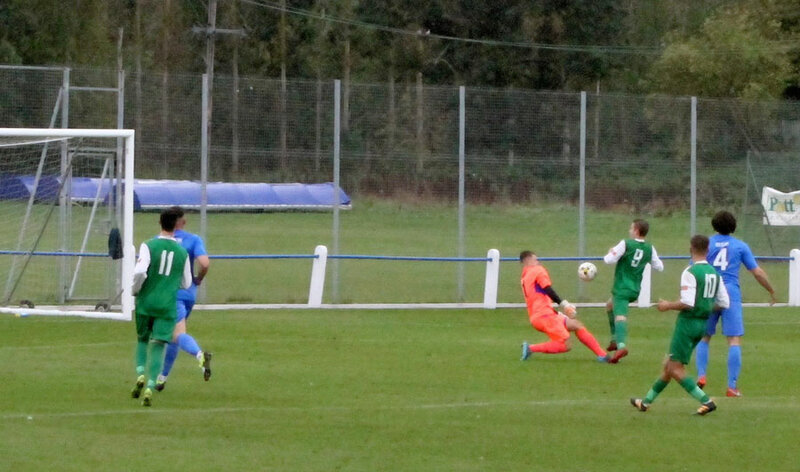 The Potton keeper denies Kerley to stop it going 4-2. 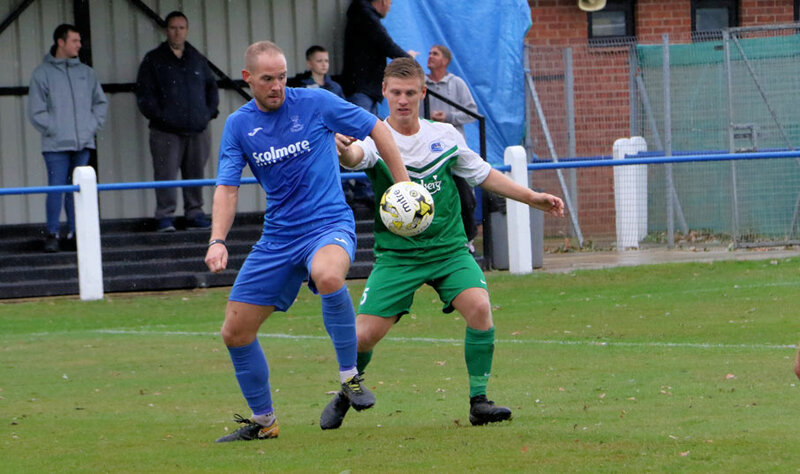 Jets back line now held firm and as tight as Dave Fuller’s wallet whose owner got a lift to the ground which was just three miles from his home rather than use his beautiful new car! 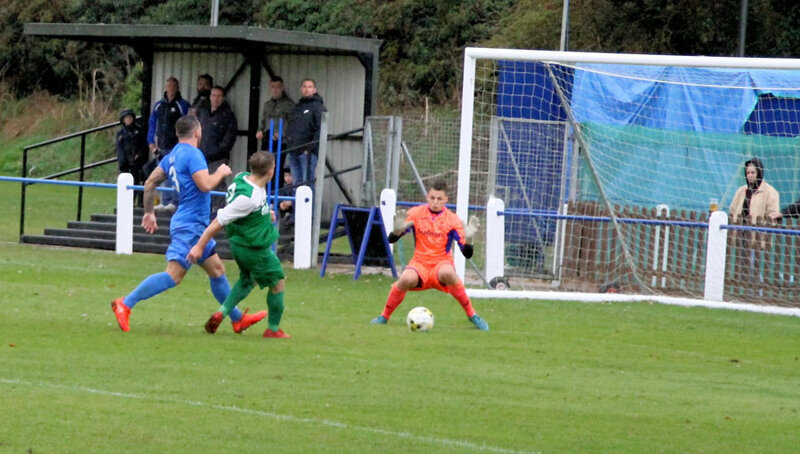 This save of the match denied Nick Kerley a hat-trick. Nick Kerley looked to have completed his hat-trick, but his superb angled shot was to get the fingertip save of the day to deny him. Jets held out to take home three excellent points. 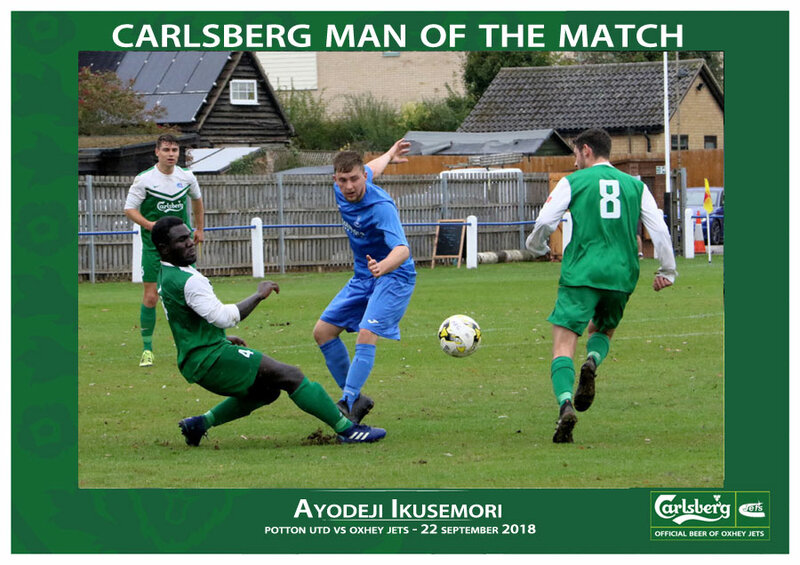 Man of the match was picked by the sidelines staff today, and they chose Deji after another outstanding battling performance as a sweeper.